If you thought Lupita Nyong'o's ensembles at the Golden Globes or the Screen Actors Guild Awards were outstanding fashion moments, you've just been bested. Nyongo's 2014 Oscar gown is nothing short of spellbinding. Dare we say it's her best red carpet look ever? Nyongo's gown is a custom-designed Prada dress, whose delicate pastel blue shade, she explained to E!, reminded her of her native Nairobi. Not only does the gown channel several of spring's hottest trends (pleats and pastels, anyone? ), but it also suits Nyong'o's established style perfectly. The actress has a well-documented fondness for beautiful, eye-catching colors in modern silhouettes from her crimson Ralph Lauren gown to her showstopping emerald Dior gown on the British Academy Film Awards carpet. This pastel blue gown makes just as much of an impact, and is all the more memorable by Nyongo's categorization of the shade as "Nairobi Blue". The plunging neckline, defined waist, and long pleats gave the garmet modern fairytale allure, but we can think of few other actresses who could wear the gown with as much aplomb and confidence as Lupita. Designer gowns rarely look both diaphanous and elegantly streamlined, but Lupita's somehow achieves both. 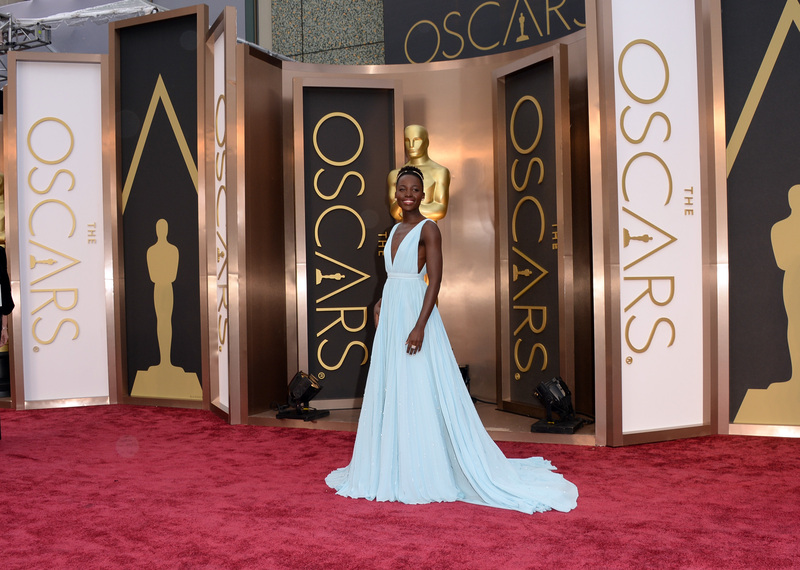 We hope she walks away with an Oscar, but at the very least, Nyong'o wins for best dressed on the red carpet.